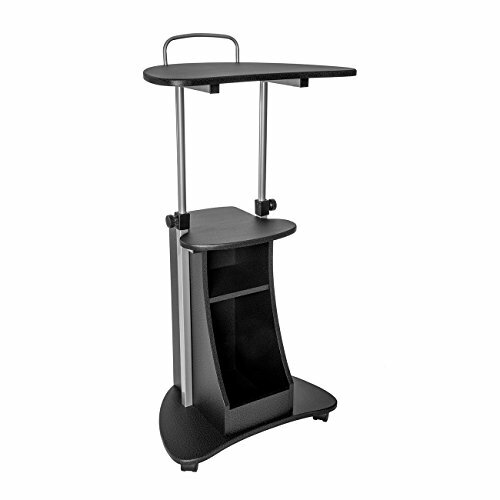 The Techni Mobili Sit-to-Stand Rolling Laptop Cart with Storage, saves space while providing the laptop or writing setup you need. You can easily adjust the table height from 28" to 43" with dual adjustment knobs. The open storage compartment features an accessory shelf. Two of the fours non-marking nylon casters include a locking mechanism. The table top, accessory, and bottom shelves each have a 22lbs weight capacity and made of MDF panels with a moisture laminate veneer and a scratch-resistant powder-coated steel frame. Color: Graphite.